Letter to Pauling from Steve Hewitt, August 1979. Dear Dr. Pauling. Several weeks ago, the Oregonian published an interview with Nathan Pritikin. In it, Mr. Pritikin referred to two studies purporting to show adverse effects from taking vitamin C…. 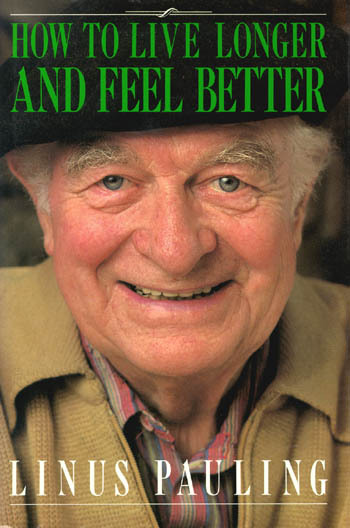 In this letter from August 1979, a concerned follower of the nutrition advice given in Linus Pauling’s then recently published book, Vitamin C, the Common Cold, and the Flu­­, confesses that, while he is following the book’s advice and is megadosing on more than a gram of vitamin C supplements every day, he is concerned about adverse effects that might arise from the practice. What, he asks, does Dr. Pauling know of a collection of studies referenced by a Dr. Pritikin and reported on in the Oregonian? Has Dr. Pauling changed his mind about vitamin C? …You ask about several statements made by Mr. Pritikin. I may say that these statements are just wrong. The reason probably is that Mr. Pritikin is ignorant about vitamins. Nathan Pritikin was a dietician who, in the 1970s, found himself in competition with Linus Pauling for the health of America. An inventor involved in various scientific fields including chemistry, Pritikin was 40 years old when, in 1955, he was diagnosed with cardiac disease. Though a slender and fit-looking man, Pritikin’s cholesterol and blood pressure were through the roof. His doctors prescribed a series of medications and told him to rest up so as not to strain his heart. Rather than following this advice, Pritikin began to read. Studying cultures both past and present from around the world, he concluded that heart disease (along with a variety of other degenerative diseases prevalent in the U.S.) could be fought, so long as one was armed with a proper diet and exercise program. Pritikin’s concept of a proper diet was one still followed by many today: low fat, low cholesterol, low sugar, plenty of complex carbohydrates and all the leafy greens and fresh fruit you could eat. The exercise regimen is also familiar: a moderate plan of preferably at least 30 minutes of aerobic activity per day. For Pritikin, the diet and exercise worked. Within months his cholesterol was lower and he felt better; within a few years, his cardiac disease was a thing of the past. Equipped with the drive and instincts of a veteran inventor, Pritikin next did what came naturally – he invented a new diet and exercise plan for America and he took it to market. Starting with his “Pritikin Longevity Centers,” meant for those who suffered from degenerative diseases, and later moving to the written word, Pritikin became one of the health gurus of the 1970s and 80s, establishing himself alongside such names as Robert Atkins and Herman Tarnower, creators of the Atkins Diet and the Scarsdale Diet, respectively. This was a space also occupied, of course, by Dr. Linus Pauling. Pauling note to self, June 22, 1978. Pauling had noticed Pritikin well before he received the letter detailing the Oregonian interview. In a letter from 1977 to Dr. Miles Robinson, a mutual friend of both Pauling and Pritikin, Pauling noted his awareness of Pritikin, his only criticism of the man and his health advice being that Pritikin “neglects his vitamins.” This is about as kind as Pauling would ever treat Pritikin in his correspondence. The following year, it became apparent to Pauling that Pritikin was not only neglecting supplemental vitamins, but had begun to speak out against them, in particular vitamin C. During a lecture given in early 1978, Pritikin implied that high doses of vitamin C could inhibit certain actions of the body’s immune system, potentially making a person more ill. After composing a memo to himself on the subject, Pauling wrote to Pritikin, telling him that several people had been made upset by his attack on supplementary vitamin C and had written to Pauling about the lecture. Pauling had just completed a paper claiming the exact opposite, complete with 386 references, and he pointed out in no uncertain terms that Pritikin was obviously incorrect in his statements. In the letter, Pritikin also included a statement and a quote that he would repeat over and over in his books, interviews, lectures and letters. First, that humans had no need of supplements so long as they ate a diet that included vegetables and fruit. And second, according to D.L. Cooper, a doctor cited as serving on the 1972 Olympics medical board, “Americans excrete the most expensive urine in the world because it is loaded with so many vitamins,” a result of all the supplements that they ingest. 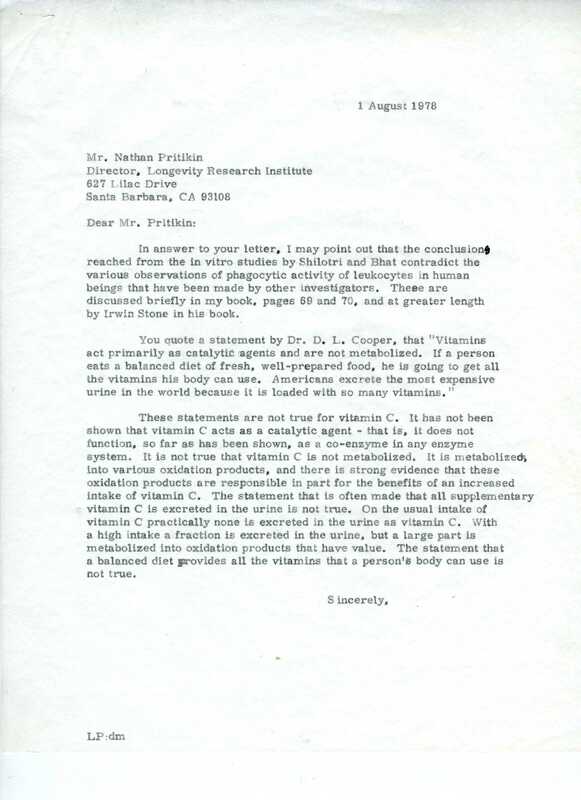 Pauling answered the attack, naturally, writing that Pritikin’s referenced studies were wrong, and that the quote about excreted vitamins, specifically vitamin C, was also fictitious. Letter from Pauling to Pritikin, August 1, 1978. Well, it’s completely wrong to take [vitamins]…For example, the most vitamin C you can hold in your body is about 20 or 25 milligrams a day. Anything over that just goes out through your urine…. If a woman is pregnant and is ready to deliver a child and she is on high vitamin C, both the mother and the child are set up to destroy vitamin C because the body can’t stand it. Now the child is born, but is not taking any new vitamin C, but the mechanism for destroying it continues for probably 10 to 15 days after you stop taking it, so on the fourth day the child goes into scurvy because its body is destroying vitamin C, but no new vitamins are coming in. Many cases are reported like that. The bacteria count rises 100 times higher when you are on high vitamin C doses. Excerpt from Pritikin’s interview in Northwest magazine, 1979. Though Pritikin called Pauling out by name in the interview, Pauling didn’t reply to the salvo, at least not directly. 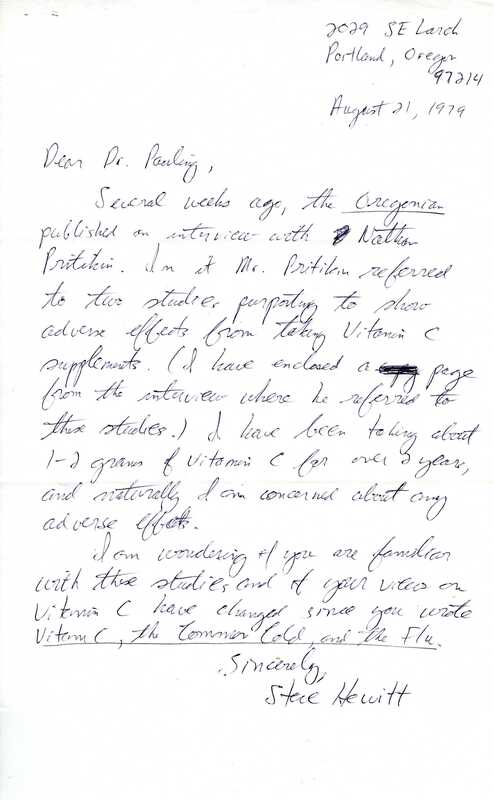 In addition to calling Pritikin ignorant of vitamins in his reply to his follower, he ended his letter with, “I think it is quite wrong for Mr. Pritikin to talk about vitamins when he knows so little about the matter.” He also sent a copy of his response to Nathan Pritikin. More exchanges occurred from there, including an one in which Pritikin, as reported to Pauling by a correspondent, quoted Art Robinson – who was suing the Linus Pauling Institute of Science and Medicine at the time – in saying that Pauling was sitting on evidence that vitamin C had the potential to cause and aggravate cancer. To that concerned reader, Pauling sent a copy of a letter that he had written to the editor of The Stanford Daily that listed all his reasons why Art Robinson was wrong. Pritikin’s final attack on Pauling’s position came during a radio interview conducted on KGO-San Francisco’s Owen Spann talk show in October 1983. Pritikin appeared on the show to promote his newest book, The Pritikin Promise: 28 Days to a Longer, Healthier Life, and to clarify some of the diet advice presented within. 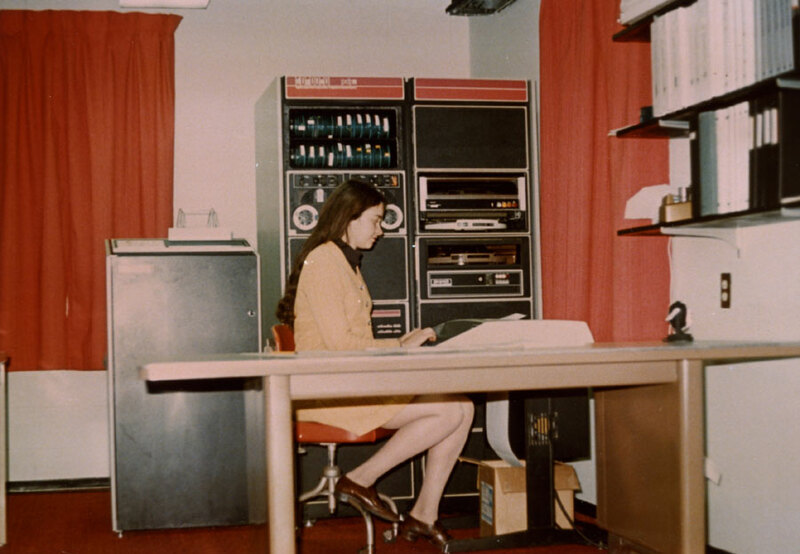 Upon hearing a recording of the interview, Pauling went in search of the Stanford study. 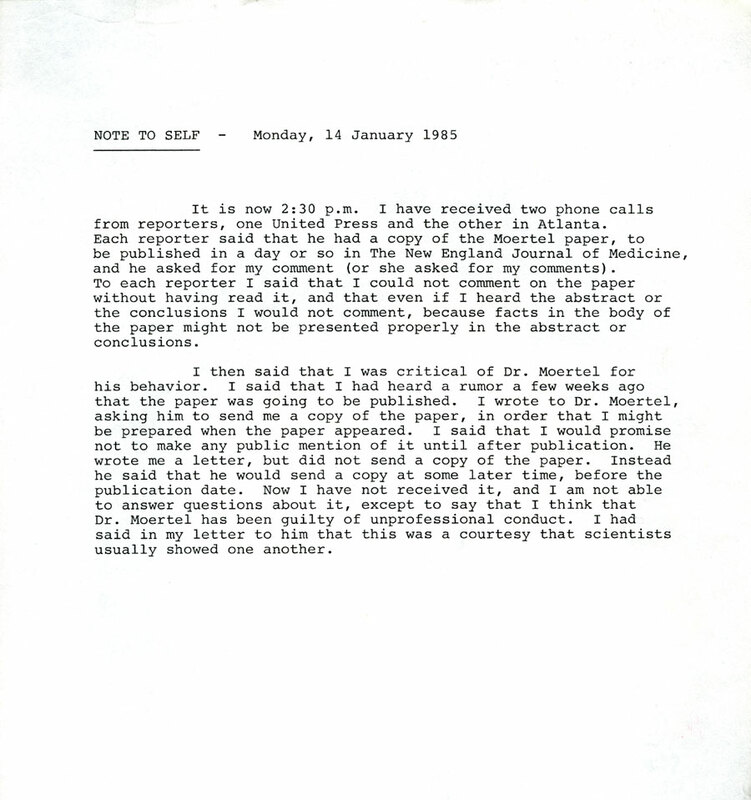 Pauling’s notes documenting his search suggest that Pritikin was lying. I telephoned Dr. Donald C. Harrison, professor of medicine and head of the cardiology department at Stanford. He says that he knows nothing about the study Mr. Pritiken [sic] said was made at Stanford, and so far as he knows Stanford has made no study of vitamin C in relation to heart disease. Pauling note to self, October 31, 1983. The disagreement between Pauling and Pritikin ended with the Spann interview. Though no longer suffering from cardiac disease, Nathan Pritkin had battled leukemia for most of the 1980s. In February 1985, he took his own life. He was 70 years old. Linus Pauling Institute of Science and Medicine staff portrait, 1989. 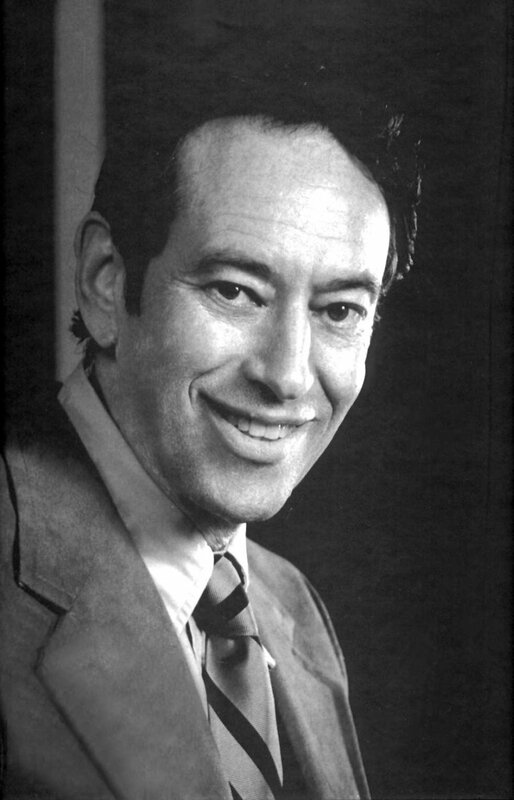 In the spring of 1980, amidst a swirl of funding difficulties and legal actions, Emile Zuckerkandl was named President and Director of the Linus Pauling Institute of Science and Medicine. He quickly began working to expand LPISM into a more wide-ranging organization with a particular focus on cellular research. His leadership style was very different from the Institute’s previous presidents, but the staff liked him and generally supported his initiatives. By this point, born of need, Linus Pauling’s relationship with the Institute began to assume a somewhat Faustian character. Pauling was contacted by, and began regularly meeting with, a man named Ryoichi Sasakawa to discuss future collaboration plans and possible donations. Sasakawa was a world-renowned philanthropist and famous businessman who had single handedly introduced and popularized motorboat racing in Japan. Sasakawa was also very controversial. An avowed fascist, he was an admirer of Benito Mussolini and a political strongman who had been charged with war crimes for his activities in support of the Japanese government during World War II. He was also very wealthy and Pauling’s connection to Sasakawa would grow over time. The summer and early fall of 1980 were largely preoccupied with the Art Robinson suits and fundraising. In August LPISM finally received some good news: the National Science Foundation had awarded the Institute a grant of $40,000 a year for two years to support research on the structure of molecules and complex ions containing transition metals. This provided a much needed financial boost, as finances were suffering greatly from the Mayo trials and the ongoing legal wrangling with Robinson. The year ended somewhat stressfully when, in December, LPISM was forced to move from Menlo Park to 440 Page Mill Rd. in Palo Alto. The landlord of their building in Menlo Park had evicted all of his tenants while he was making structural repairs to the facility. Once completed, he decided not to welcome LPISM back, instead inviting more profitable companies to take their spot. The new building in Palo Alto was dramatically bigger and less expensive; it was also quite a bit shabbier, in part because it was made out of cinderblocks. Employee Alan Sheets was able to help save the Institute a lot of money during the transition, as his father was a professional mover. As such, the Sheets family helped LPISM move itself instead of hiring the process out to a company. Extracted from the LPISM Newsletter, Winter 1980. The dawn of 1981 brought with it major financial relief for LPISM. After eight failed tries over eight long years, the National Cancer Institute finally agreed to fund a component of LPISM’s program – a two-year grant for $204,000 to research the effects of vitamin C on breast cancer in mice. At about the same time, Sasakawa’s company, the Japanese Shipbuilding Foundation, pledged $5 million to the Institute over the following ten years. As part of the deal, LPISM began working with Sasakawa to create the Sasakawa Aging Research Center, which was set up as a satellite facility on Porter Drive. Later in the 1980s, the building at Porter Drive suffered a major roof leak which destroyed thousands of pages of research and documentation. Thomas Hager, one of Pauling’s biographers, notes that LPISM successfully sued the landlord for neglecting to maintain the building. Despite this influx of new cash, the close of 1981 proved to be an awful time for Linus Pauling and LPISM. In August, Ava Helen Pauling’s recurrent stomach cancer was declared inoperable and on December 7, after struggling with cancer for five years and three months, Ava Helen died. 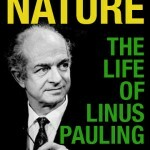 Linus Pauling was absolutely devastated, and the LPISM staff was greatly saddened by the loss as well. Pauling understandably did not cope well with the passing of the woman who was his wife for nearly 60 years, and he effectively ceased to be involved in LPISM except in the most cursory of ways, choosing instead to spend much of his time alone at his ranch in Big Sur, California. The year that followed was, unsurprisingly, a tough one. Pauling remained in mourning and didn’t really contribute to LPISM, the Robinson suits dragged on, and the Institute’s fundraisers still struggled to cope with the fallout from the Mayo Trials. The NCI and Sasakawa donations helped to keep operations running, as did some of the revenue from Pauling and Cameron’s book, Cancer and Vitamin C. In the summer of 1982, Pauling took a trip throughout the Pacific Northwest where he visited many of his and Ava Helen’s favorite spots, as well as the cemetery where his maternal grandfather Linus Wilson Darling rested. The trip brought him closure and by the fall he became active at the Institute again. In February 1983, the lawsuits with Arthur Robinson finally ended, with LPISM paying an out of court settlement of $575,000. The Institute adamantly maintained no wrong doing, instead acknowledging the fiscal prudence of settling as opposed to prolonging the court battle, which was nearly five years old by that point. Their legal problems resolved, LPISM fundraisers redoubled their efforts to regain their financial momentum, as the lawsuits had drained them of resources. 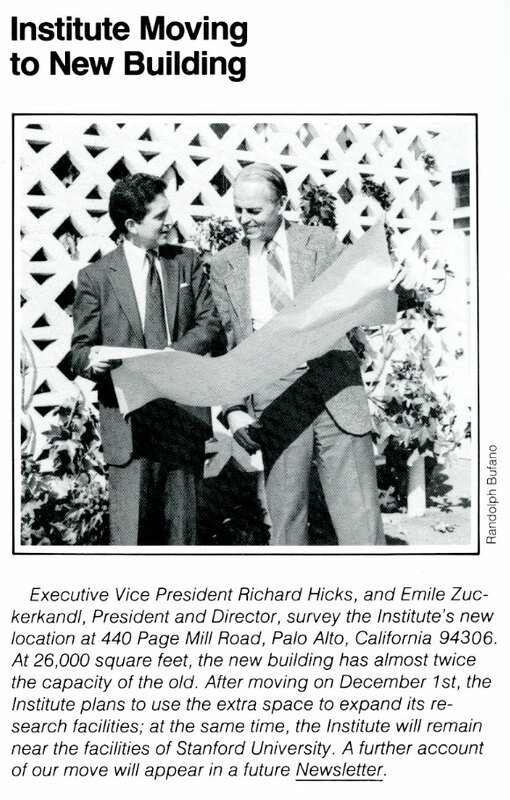 Past fundraising techniques were unable to generate much steam, so Rick Hicks began cultivating relationships with individual, extremely wealthy donors, notably Armand Hammer, Ryoichi Sasakawa and Danny Kaye. As a part of this strategy, LPISM began annually awarding individuals – typically major donors – the Linus Pauling Medal for Humanitarianism. Sasakawa was its first recipient. In November 1983, LPISM researchers announced that they had discovered a new type of chemical bond that mimicked the bond believed to exist between bulk metals. This was a fairly important discovery, and also helped restore some measure of favorable public opinion as people saw the good work that LPISM was doing. The announcement also reminded folks that LPISM wasn’t just about vitamin C research. The next year, in 1984, Pauling received the extremely prestigious Joseph Priestley Medal from the American Chemical Society for his lifetime of work and dedication in the field of chemistry. However, the controversy over vitamin C was never far from the Institute and more arrived in a hurry when, on January 2, 1985, the Mayo Clinic released the results of its second set of trials. The Institute was given no warning of the release or chance to read the results in advance. This infuriated Pauling who saw it as an obvious insult levied by the study’s principal investigator, Charles Moertel. Pauling Note to Self, January 14, 1985. Perhaps unsurprisingly, Moertel announced that the study had reaffirmed his earlier assertion that vitamin C was useless in cancer treatment. Upon reading the report though, Pauling deduced that Moertel hadn’t actually examined Ewan Cameron’s papers, the very studies he was supposed to be replicating. 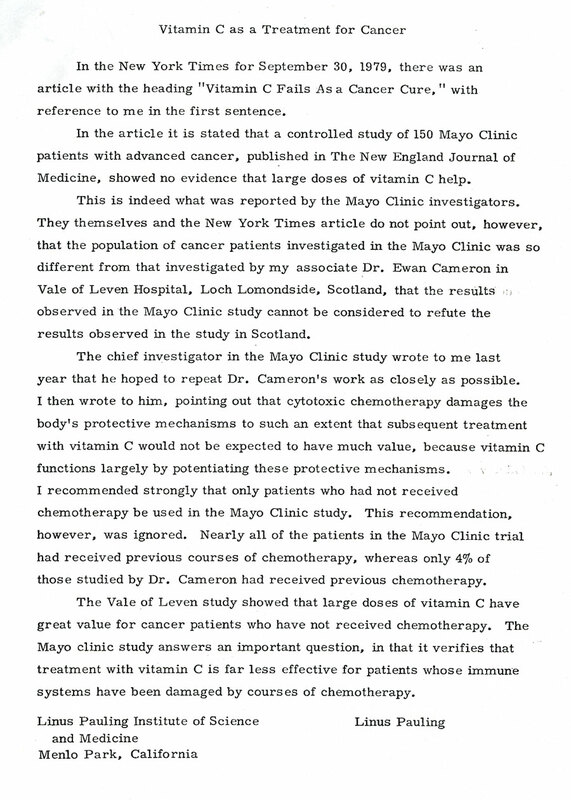 Among other deviations, the amount of vitamin C used in the Mayo trials was lower than in Cameron’s studies, the amount of time that patients had been given vitamin C was shorter and patients were given vitamin C orally instead of intravenously. Both Pauling and Cameron publicly branded the Mayo report as “fraudulent” and angrily decried the false assertion that Moertel had closely replicated their work. Many journals and newspapers refused to publish Pauling and Cameron’s rebuttals, or published them months after they were submitted such that the responses were no longer relevant. As a result, LPISM suffered still more financial hardships as public opinion once again swung away from the Institute and many people stopped donating. The direct-mail appeals that had been so successful in years past were only bringing in 25% of what they had a few months previously. By 1986 LPISM was struggling with funding and also public awareness – the second Mayo Clinic trial seemed to have largely sealed public opinion on vitamin C research. But Pauling was still convinced that vitamin C had more merit than was being considered, and in support of this cause he published How to Live Longer and Feel Better. The book was well-received by critics and sold well. For the Institute, its successes were manifold, as it provided a morale boost to LPISM staff, brought in sorely needed funds and dramatically raised awareness of the organization and its activities. Shortly afterward, Cameron and fellow LPISM employee Fred Stitt found themselves swamped with phone calls and letters to the Institute about health questions and recommendations. They quickly developed a standardized health information packet which they would mail out to people making more generic inquiries. Through it all, the Institute continued to follow Zuckerkandl’s lead in expanding its research into areas outside the realm of orthomolecular medicine. In 1987 researchers began extensive work on protein profiling and the effect of phytic acid in cancer prevention, a program that was more or less entirely supported by a philanthropist based in New York. The Institute also began working on superconductivity in 1988. In particular, Pauling hoped to develop a room-temperature superconductor which he could then market as a stable revenue source for the Institute. Zuckerkandl, Steve Lawson, Pauling and even Cameron began working on this project, which utilized a material made out of borosilicate glass and tin. The process involved using a blowtorch and an inverted bicycle with its tires taken off the wheels. 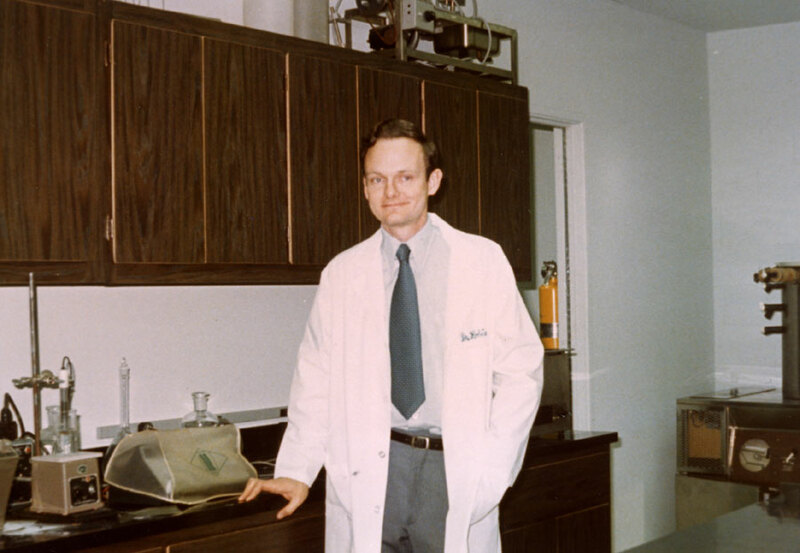 Pauling would often come down to the labs and help with the physical research and experimentation – it was the last research project he actively participated in. The process worked and the material was developed according to Pauling’s specifications. He received a patent for it early in 1989, and immediately began trying to market it, though ultimately without success. The decade of the 1980s drew to a close on a mixed note for LPISM. The organization was, as always, struggling with controversy and financial problems. However, research was progressing well, popular support was increasing, and Pauling had come to terms with the death of his wife. The decade had seen its ups and downs, and what lay ahead would be no different. 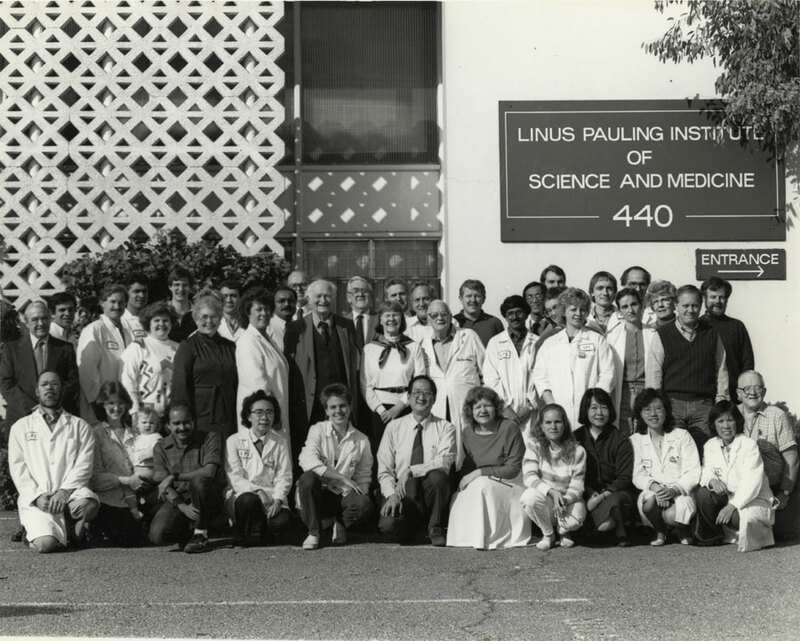 By late 1978, the Linus Pauling Institute of Science and Medicine had reformed its fundraising strategy, an action which proved to be quite successful. As a result, for the first time in its five years of existence, LPISM was not struggling to keep its head above water. This wave of good fortune carried with it unforeseen negative consequences. In particular, Rick Hicks and Art Robinson began to come into conflict over the best way to invest this sudden surplus. Robinson suggested that LPISM move to Oregon – which had recently announced “Linus Pauling Day” in honor of its native son – and build a campus of its own. The idea was not popular with many staff, most of whom did not want to leave the Bay Area. Robinson continued to press for closer ties between LPISM and ORI, a source of growing tension between him and Pauling. In particular, Pauling was angered when he learned that Robinson had begun to tailor experiments in accordance with Hunsberger’s ideas without first consulting Pauling. When confronted, Robinson defended his decision and redoubled his arguments for collaboration. Their relationship continued to sour and morale at LPISM plummeted as the tension between Pauling and Robinson mounted. 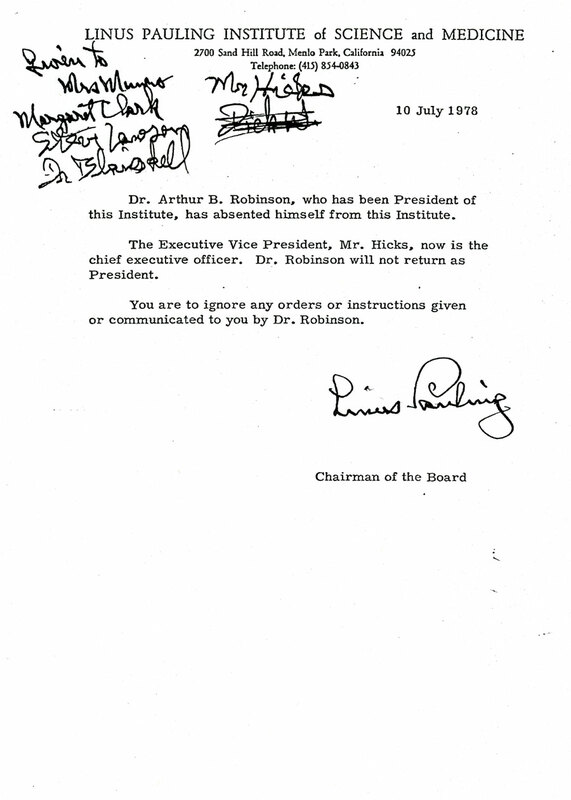 In June 1978, Pauling issued a memorandum to Robinson, ordering him to consult the Executive Committee – comprised of Pauling, Robinson, and Hicks – before making “any important decisions.” Robinson responded by immediately firing Hicks. Pauling responded in turn by overruling the termination and demanding Robinson’s resignation within thirty days. He then proceeded to issue a memorandum informing Institute staff that he had stripped Robinson of his position, and that the staff was to disregard all further instructions from Robinson. The next day, the staff arrived at work to find a second memorandum from Robinson, declaring that he was still the president, that neither Pauling nor Hicks had the authority to relieve him of his duties, and that he would not resign. Pauling memorandum of July 10, 1978. The Board of Trustees met in mid-July to try and settle the dispute. They decided to place Robinson on a thirty day leave of absence, empowered Pauling with all executive authority and told him to resolve the issue. On August 15, with Robinson’s leave expired, Pauling was elected President and Director of LPISM. On August 16, Pauling promptly informed Robinson that he was taking over all of Robinson’s research, Emile Zuckerkandl was being appointed Vice-Director, and that Robinson was fired. Now that Robinson was gone, LPISM attempted to consolidate and return to normal. Pauling asked Steve Lawson to assume a portion of Robinson’s research agenda, a request to which Lawson consented. Over the course of 1978, Lawson had steadily become less involved with the financial arm of LPISM and more involved with its scientific work. Zuckerkandl also tasked Lawson with setting up a cell culture facility where the two would conduct research on the differences between primary and metastic cancer cells, as revealed by protein profiling. Lawson worked closely with UC-San Diego, University of Colorado, and SRI International. He was later joined on that project by Stewart McGuire, Eddy Metz, and Mark Peck, all fellow employees at LPISM. Robinson, however, did not take his firing lightly and on August 25, LPISM was informed that Robinson was suing the organization for $25.5 million, alleging a breach of contract and unlawful termination among other charges. LPISM’s lawyers began gearing up for a serious legal battle, standing firm in their conviction that the Institute had done nothing wrong. Meanwhile, the Institute’s vitamin C research continued on despite the added burden of the Robinson lawsuit. 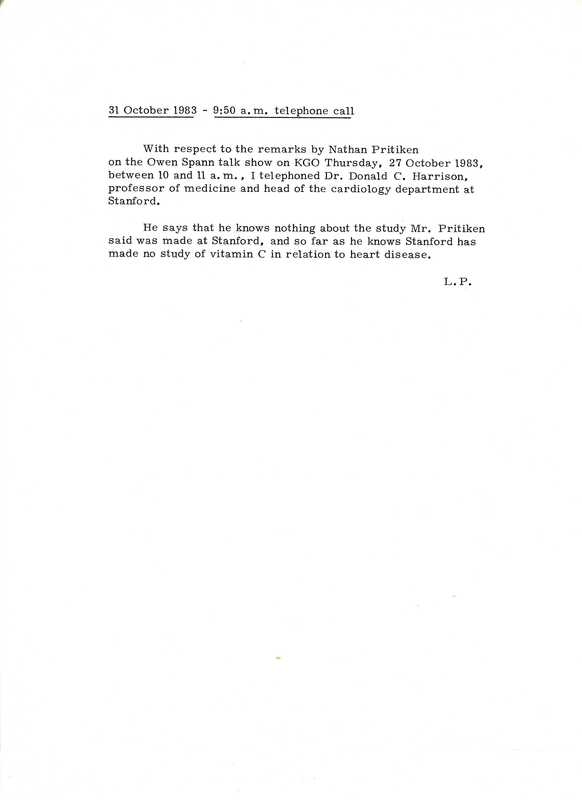 In early October 1978, Pauling convinced Ewan Cameron to accept a one-year appointment to LPISM while the two worked on a book about vitamin C and cancer. Additionally, Pauling, Cameron, Lawson, and their coworker Alan Sheets began an experiment to determine the effects of vitamin C on chemotherapeutic drugs. The research took the form of a toxicology experiment in which multiple groups of fish were subjected to chemotherapeutic agents in their water, after which various groups were given different amounts of vitamin C while the research team observed the results. The year 1979 started with good news. LPISM was informed by Hoffmann-LaRoche, the world’s largest producer of vitamin C, that they had seen sales more than double during the 1970s, and they fully recognized that Pauling was the cause. As a thank you, they had decided to donate $100,000 a year to the Institute. The happy days were not to last long. In April, LPISM received an advanced release of the results of the major Mayo Clinic study on the treatment of cancer with ascorbic acid. Its primary investigator, Charles Moertel, had concluded that vitamin C did absolutely nothing to help cancer patients. Pauling was stunned and immediately began writing to Moertel to discuss the study in detail. Then, over the summer, Art Robinson filed six more charges against LPISM and Pauling, bringing the total number of suits to eight and the total requested damages to $67.4 million. The year-long and highly publicized suit was greatly hurting LPISM’s reputation, and the Institute noticed a subsequent decrease in the donor funds flowing their way. 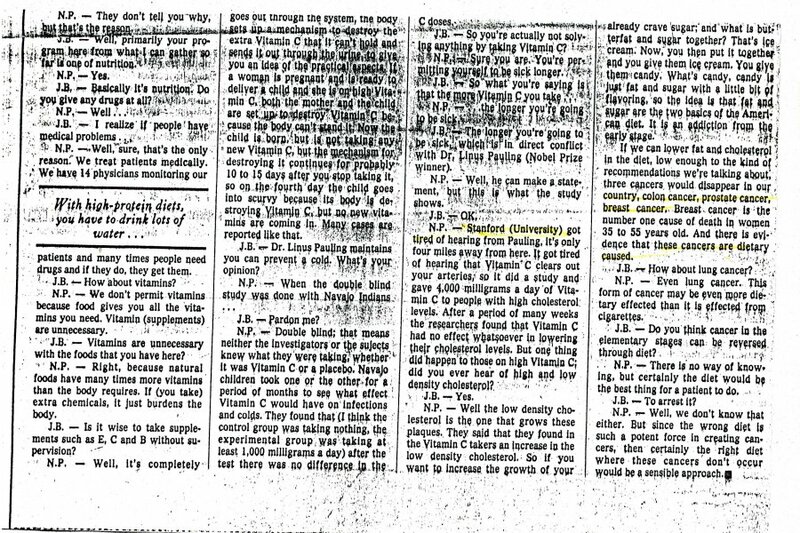 “Vitamin C Fails as a Cancer Cure,” New York Times, September 30, 1979. Things then went from bad to worse when, on September 27, the New York Times published the Mayo Clinic study, definitively stating its conclusion that vitamin C was useless in treating cancer. Pauling immediately responded by pointing out that the patients involved in the test were undergoing cytotoxic chemotherapy, which he felt crippled their immune system. He also asserted that the trial was not conducted for long enough to develop accurate results. Pauling’s response to the New York Times article, October 24, 1979. Charles Moertel returned fire, defending his results and questioning Pauling, implying that he was fanatical in his zeal for vitamin C and refused to acknowledge the truth. Pauling and Moertel began exchanging volleys in public, writing articles and giving interviews that attacked the research and competence of the other. Unfortunately for Pauling, he took the worst of it, as many people began to agree with Moertel, thinking Pauling to be too enamored with vitamin C to see any negatives. Funding plummeted as donations shrank and LPISM began finding large numbers of grants rejected outright with no chance for an appeal. Pauling refused to give up. Shortly after the New York Times article was released, he and Cameron published their book, Cancer and Vitamin C. Pauling personally bought 16,000 copies of the publication and mailed them to every member of Congress and to countless other physicians and researchers. This action helped Pauling’s cause significantly as many of the recipients read the book, or at least glanced through it. And even those recipients who didn’t read the text were made more aware of Pauling and his research. Likewise, in the marketplace the book sold well despite the bad reception it received from professional reviewers – the public seemed interested in Pauling and Cameron’s ideas. In light of this, National Cancer Institute head Vincent DeVita agreed to a second round of trials. However, in doing so DeVita once again chose the Mayo Clinic to host the trials and chose Moertel to lead them. Pauling was furious with these decisions, an understandable point of view considering that he and Moertel had spent the past few months publicly accusing one other of being incompetent. Pauling was also now without his co-author: their book completed, Ewan Cameron returned to Scotland to fulfill his duties at Vale of Leven Hospital. Before leaving, he was appointed a Research Professor at LPISM for a period of five years. With a new decade approaching, the easier times of the mid-1970s were clearly gone and by early 1980 the future was once again uncertain. While the tensions evident during the Art Robinson era were now history, his lawsuits and the Mayo Clinic trials severely detracted from the future prospects of LPISM. Unfortunately for the Institute and Linus Pauling, their immediate future was not going to be a happy one. 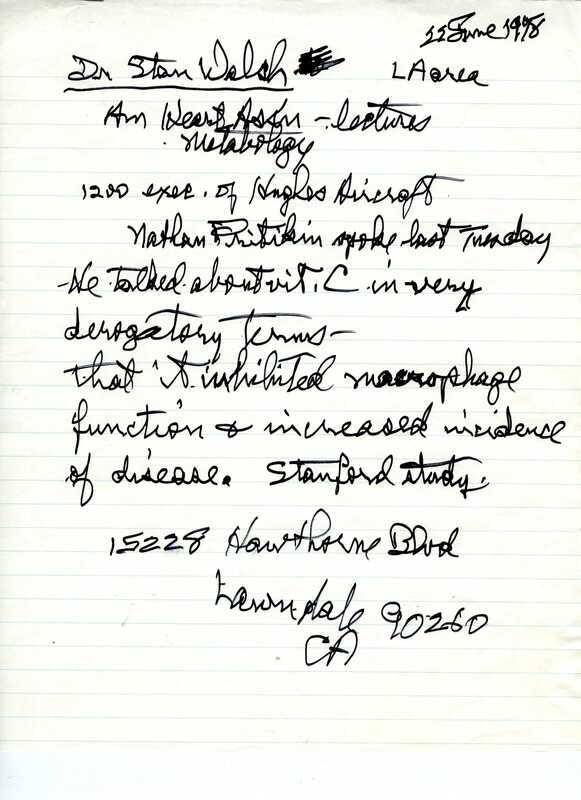 In 1969 Linus Pauling was given his own laboratory at Stanford University for his work on schizophrenia, where Art Robinson, a colleague and fellow researcher, joined him. By 1972 Pauling and Robinson had decided that their Stanford facility no longer afforded the space necessary to continue their research, and in May of that year Pauling requested that the university construct a new building to house an expanded lab for him to use. The institution hesitated in responding, as its administration was somewhat wary of Pauling at that time, given the controversy that surrounded both his scientific interests and political activism. Pauling had recently co-authored controversial work with the Scottish physician Ewan Cameron about vitamin C and its usefulness in treating cancer, research which alienated him from much of the medical community. For its part, Stanford was very unsure about the wisdom of giving him a new lab to further that research. Likewise, Pauling was working hard and visibly for global peace in the middle of the Cold War, activities which had long caused many people to suspect that he harbored communist sympathies. Almost as if to verify that accusation in their minds, he had been awarded the Lenin Peace Prize by the Soviet Union in 1970. Pauling was a harsh and public critic of the war in Vietnam, President Richard Nixon, US nuclear policy, and US foreign policy, which only served to legitimize some people’s doubts about Pauling’s loyalty to the United States. And if that wasn’t enough, Pauling had also publicly protested Stanford’s firing of a tenured professor known to have leftist, anti-war leanings. Stanford took these numerous activities into consideration, and decided to deny his request. In response, Robinson suggested that Pauling step down from the Stanford faculty and move their research off campus, which they did, relocating in early 1973 to a building that Robinson had found nearby. Their new home was at 2700 Sand Hill Rd. in Menlo Park, across the street from the Stanford Linear Accelerator building. The space was in an office building shared with Kemper Insurance, a location never designed to accommodate scientific research. Nonetheless, Pauling and Robinson adapted, figuring out how to fit their lab into a footprint of less than 20,000 square feet – an area designed to hold desks and chairs instead of wet labs. An Institute employee working at the Sand Hill Rd. facility, 1974. Freed from their affiliation with Stanford University, Pauling, Robinson and Keene Dimick – a biochemist who agreed to help pay the rent for their new quarters – decided to form a brand new institute. 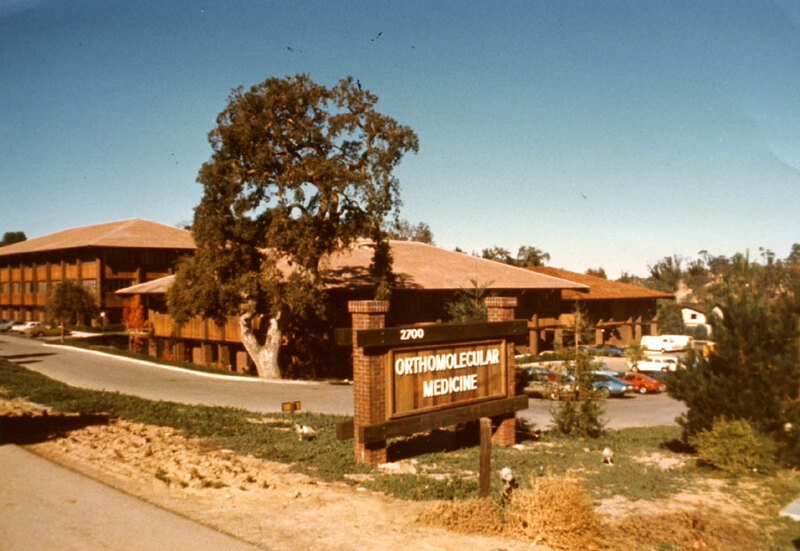 On May 15, 1973, the Institute of Orthomolecular Medicine was founded as a California non-profit research corporation with the stated goal of researching biology and medicine. Immediately the Institute began trying to solve a problem which would plague it for most of its existence: funding. Pauling and Robinson began by lobbying all of their friends and associates for money, trying to entice them in part by offering them largely honorific positions on the Board of Associates of their new Institute. Over thirty people agreed to help, including Francis Crick, Maurice Wilkins and a number of other Nobel laureates. The funds generated weren’t princely, but they were enough to get the Institute standing. On the research end, the Institute began by continuing the program that Pauling and Robinson had been conducting at Stanford – mostly work on vitamin C and metabolic profiling. 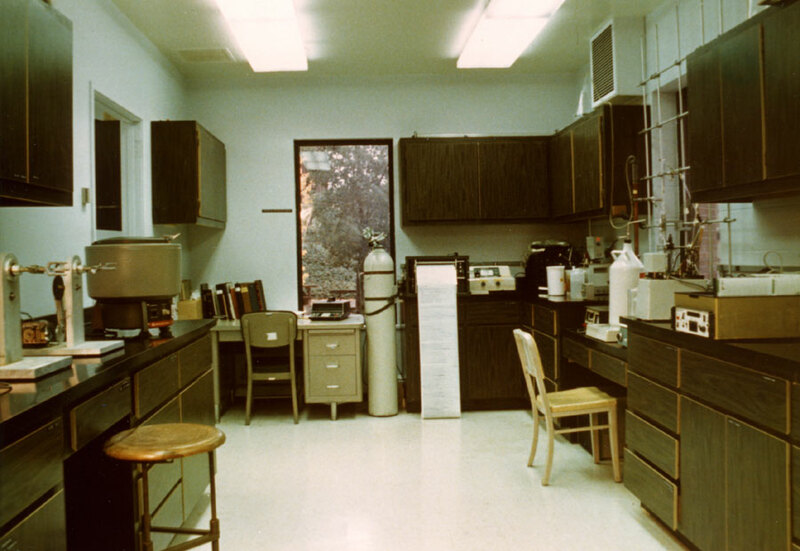 The new labs contained a large number of animal experiments, which took up a great bulk of the very limited space, as did the Volcano Source Field Ionization Mass Spectrometer, a new device that was being developed by Bill Aberth, a recent hire who had previously worked for SRI International. Pauling wanted to help people with his research on vitamin C, and in 1974 he opened a small outpatient clinic which was run by John Francis “Frank” Catchpool, a doctor whom Pauling had met in 1959 while visiting Albert Schweitzer’s medical hospital in Africa. Unlike Schweitzer’s venture, the Institute’s clinic was immediately beset with major problems – liability was too high and funding was too low. Additionally, because vitamin C was cheaper than other medication, the clinic often found itself overwhelmed by destitute patients. The staff often ended up working for free, as people would arrive who were too poor to pay anything, but Cameron and other staff would still help out of sympathy and a desire to do good. Due to severe limitations on resources, the clinic closed in 1975, eight months after it opened. Interior view of the Sand Hill Rd. facility, 1974. As 1974 progressed, the Institute’s funding problems became increasingly ominous, exacerbated by the fact that Robinson was one of the only people on staff who was adept at fundraising. In July the Board decided to start addressing the problem by renaming the Institute of Orthomolecular Medicine. They came to the conclusion that the term “orthomolecular” was not only too difficult to explain to most potential donors, but that the term had been tainted by a recent barrage of attacks on vitamin C by the American Psychological Association. They also decided that having Pauling’s name attached to the Institute would help with funding, due to his international fame and respect. On July 26, the Institute was renamed the Linus Pauling Institute of Science and Medicine (LPISM). The Board’s choice proved to be a good one, and more funding began to come in. Even still, it wasn’t enough, and for much of 1974 LPISM was kept afloat through financing from Pauling and Robinson’s personal accounts. Unsurprisingly this too proved to be insufficient and by early 1975 LPISM was in danger of succumbing to bankruptcy. Desperate, the Institute’s administrators were forced to exact pay cuts for all employees, but did so on a sliding scale designed to minimize the impact on workers with already low salaries. It was at this point that Robinson confronted Pauling, accusing him of neglecting his work as president. Pauling had in fact been neglecting daily duties, boasting to the press at one point: “I don’t waste time on needless details.” Unfortunately, many of these details weren’t needless, and his administrative inattention was harming the Institute. Pauling asked Robinson if he thought he could do better, to which Robinson replied that he could. Pauling responded by making Robinson President and Director of LPISM. Still the financial issues became worse: Pauling donated 75% of his income to LPISM for the first half of 1975, and then 100% of his income in the second half of the year. In the meantime, the Institute staff began experimenting on hairless mice. For a week before the tests, they would feed the mice food full of vitamins C and E. Next they began irradiating them with ultraviolet light to produce skin cancer and observed the effects of the high-vitamin diet on cancer growth. As a result of this research, Pauling developed a cocktail of vitamins, which he put into a single dose that he called the “Linus Pauling Super Pill.” The Institute considered marketing the pill to raise additional funds, but that plan fell through and the Pauling Super Pill was relegated to a formula in a filing cabinet. The Institute found itself in a bad place by the end of 1975; saddled with massive financial problems, it was uncertain if it would survive. And amidst this struggle, fortunes were about to get both better and worse for the Linus Pauling Institute of Science and Medicine.